Alcohol and addiction treatment may have just gotten more plain and simple. New NIH grant money is being awarded to researchers to identify possible links between fitness and drug prevention and the benefits of exercise in drug rehab centers. Do addicts and the general population really need this PROOF before they’ll work out daily? The Department of Health and Human Services is sponsoring studies that examine neurobiological and behavioral mechanisms that underlie the effects of physical activity on brain function. They’re specifically interested in the effects of exercise, fitness and physical activity for the prevention and treatment of drug abuse. The theory is that exercise may provide a prophylactic effect and/or an ameliorative treatment effect for addiction. But how is physical activity linked to improved psychological well-being? Exercise and fitness is so good for you, that I doubt that this study can go wrong. Running, biking, walking or working out in a gym feel freakin’ good. I don’t know why. But it works. People regularly participate in sports teams, martial arts, or outdoor adventure and like both healthy leisure and restorative recreation (think nature walks or hiking). Plus, vigorous expressive activities, such as dance and the open-ended free play of children leave you feeling high! But what’s interesting is that recent advances in neuroimaging technologies such as fMRI, MRI, PET have the potential to define the effects of physical activity on the brain processes underlying drug abuse behavior and addiction. These technologies can literally SHOW us what we’re feeling. So what we once knew as a “natural high” might now become known to science. In my opinion, a mandatory 30-45 minutes of daily physical exercise should be present in any addiction treatment setting. Optimal rates will vary according to age, weight, etc…but addicts have got to get moving. 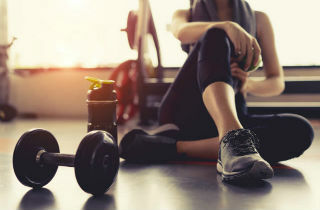 Not only will this improve desired health outcomes (cardio-respiratory health, musculoskeletal health, functional health, energy balance, cancer prevention), but mandatory fitness can certainly help addicts release emotional and mental blocks that might occur during cognitive behavioral therapy sessions. It’s my guess that exercise and fitness can only positively affect mood, sleep, cognitive function, stress, craving, diet and weight. What do you think? Is this a no-brainer? Do we just need to see the stats to believe our bodies? And what holds addicts back from exercise in the first place? What can we do to get us off our butts and into a gym? P.S. If you’re eligible and interested in money from the National Institute on Drug Abuse (ie. NIDA grant RFA-DA-09-013), click. But hurry up. This grant opens on December 28, 2008 and will close a month later. Go-go-gadget government grants! Most addicts will benefit from exercise, but since exercise is psychoactive, some addicts will be chemically predisposed to get hooked on it. There is potential for habit-switching with exercise. The first time I went to treatment, I was placed on total exercise restriction because I had a long history of using exercise the same way I used alcohol, as an excessive, compulsive form of self-medication. I’d do things like work out five hours a day, go on twenty mile walks, and do calisthenics in my room at night when I couldn’t sleep. I didn’t even notice my alcohol withdrawal, because amazingly, my physiological and psychological exercise withdrawal was much more severe and very scary! The bottom line: if it’s psychoactive, an addict will find a way to abuse it. Exercise can be a great part of recovery, but be careful! Exercises are definitely a great way for the complete well being of human body. These exercises also include the strength training program that improves the capabilities of our body in improving the strength, balance and energy levels. They are very effective in drug treatment programs since they can facilitate quick recovery from the addiction that can help the addicts lead a balanced and improved lifestyle. We go to the gym 5 days a week and have meetings on the beach at Sober Living by the Sea in Newport Beach, CA. well exercise is one of the essential part of curing addiction, you definately have to get your mind set first.i have done drugs for almost 12 years and tried detox several times and none of them worked.all the theraputic routine courses and objective exercises i did in Narconon course has absolutely helped me a lot.i have been clean for the longest period of my life since i started doing drugs and currently i am training in Narconon Arrowhead in Oklahoma.i cant thank Narconon enough. A half of an hour of exercise daily is good for all of us. However, when you are trying to cure an addiction, the first thing to do is change your mind set. When you change your mind set half of the battle is already won. Renewing your mind should always be your first step to freedom.